Fitness, like fashion, is cyclical. Spend enough time even thinking about staying healthy, and you’re bound to see some of the same things come in and out of style. But in the midst of boutique fitness fads and the rise of personal tracking technology, one exercise has persisted, and for no good reason: sit-ups. Most people still assume that the path to decent-looking abs is paved with sit-ups. Which is a damn shame, because they aren't even that effective, and are potentially damaging -- try these ab workouts instead. Planks can be truly awful in the moment, but they really are one of the most effective total-core exercises. They do an outstanding job of challenging your abs and lower back at the same time, which is a hell of a lot more than sit-ups can say. Where most people screw up is trying to plank for too long. Don’t expect to stay in the pose an absurdly long time on your first attempts. Quality matters far more than quantity for planks. 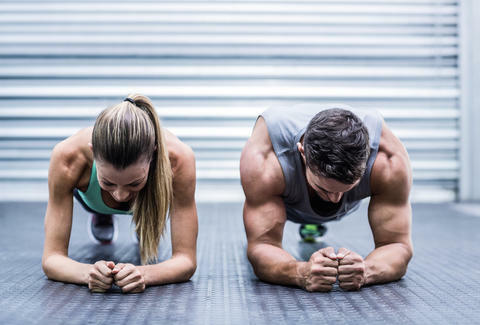 Try planking for three rounds of 20 seconds each round, three times a week. Then the next week, shoot for 25 seconds. It’s a simple way to get in a better ab workout, get stronger, and keep your back healthy. The regular plank has an evil cousin that most people despise with every fiber of their being: the side plank. But just like the plank, the side plank is one of the best exercises for training the core properly, especially the obliques. The obliques are those muscles that run along your sides, typically where you develop love handles. Side planks train the obliques to resist rotation, while keeping your abs and lower back rigid. As with planks, most people go wrong by trying to do too much at once. Try three rounds of side planks for 15 seconds a side after you finish your regular planks. Next week try and up it by five seconds. This is a bit more of an obscure ab exercise, but is one of the best out there for challenging the entire core at once. Stir the pot looks kind of like a plank done with your forearms on an exercise ball. In fact, that’s exactly how you set yourself up. The challenge is the actual stirring -- your job is to make circles with your forearms, moving the ball in the process. You should find that your abs hate you, your obliques want to cry, and your lower back is screaming in agony; in a good way, of course. Like always, it's about the quality, especially since in the beginning, balance is going to be half the battle. I suggest people try out three sets with five circles going each direction, three times a week. Sit-ups may be popular, but so were acid bell-bottoms and parachute pants. Luckily we've gotten smarter when it comes to fashion -- let's do the same when it comes to working our abs. Ditch the sit-ups and start training smarter. Tanner Baze is a writer and trainer based in Atlanta whose abs really hate him, in a good way. Follow him on Twitter: @dtbaze.